new crop of persimmons are available in a variety of shapes and colors. I came home with a bag full and put them in a favorite dish. I loved how the contrast of colors and textures played off of each other: orange-red against blue-green. Smooth against rough. When Daniel Smith Artists’ Materials asked if I’d like to try their Walnut Ink. I was eager to give it a try. I am particularly fond of inks with warm tones. The idea of drawing the persimmons with walnut ink was appealing. Before the bottle arrived I did a little research on their website. I thought walnut ink would fade. I was wrong. Here is what I found. Watercolor Paper is Bockingford cold press 140lb. 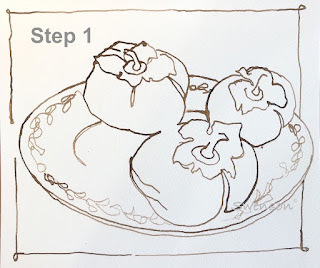 My favorite technique for drawing is continual line contour. I keep my pen on the paper for the majority of the drawing. I am using a bamboo reed pen…Why? I enjoy line variation. I start by pulling fresh color into the center of my palette. I work on a dry surface and mix the colors on the paper. 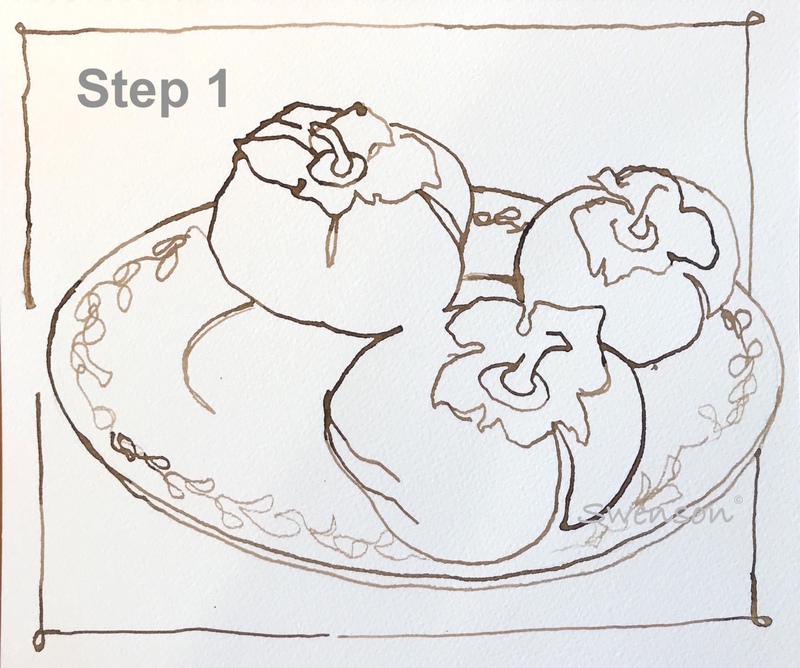 You’ll noticed the Walnut Ink moves…I like that. If I touch the line gently it will move a little and more if I scrub the line with my brush the more it moves. 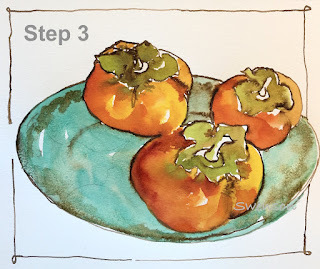 The persimmons are a mixture of Hansa Yellow Medium, Anthraquonoid Scarlet & Quinacridone Burnt Orange. The Leaf and stems are Quinacridone Gold & French Ultramarine. The plate is painted with Cobalt Teal Blue. I intentionally disrupted the details on the plate with my brush. I want the lines to defuse. 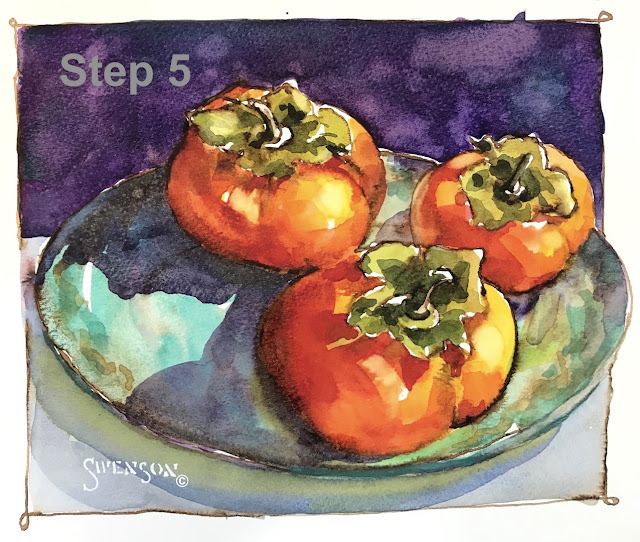 I don’t want the lines to be in sharp focus especially since the majority of the plate will be effected by shadows from the persimmons. Shadows are my favorite subject! The presence of light defines form and gives life to a subject. I begin my making two puddles of paint on my palette: 1. Quinacridone Burnt Orange & Quinacridone Rose 2. Imperial Purple. 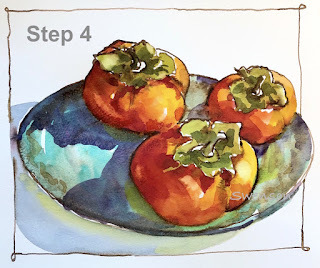 I start by painting the form shadows on the persimmons with Quinacridone Burnt Orange & Quinacridone Rose and quickly move into the cast shadows on the plate with Imperial Purple. I want a soft transition between the objects and the colors. The final stage I use Imperial Purple in the background. Before the passage has lost its shine I touch a small amount of Phthalo Turquoise into the area. Final touches are added to the foliage area. My Daniel Smith dot card has a white X on the colors I used for this piece. All the materials used in this demonstration are listed below. 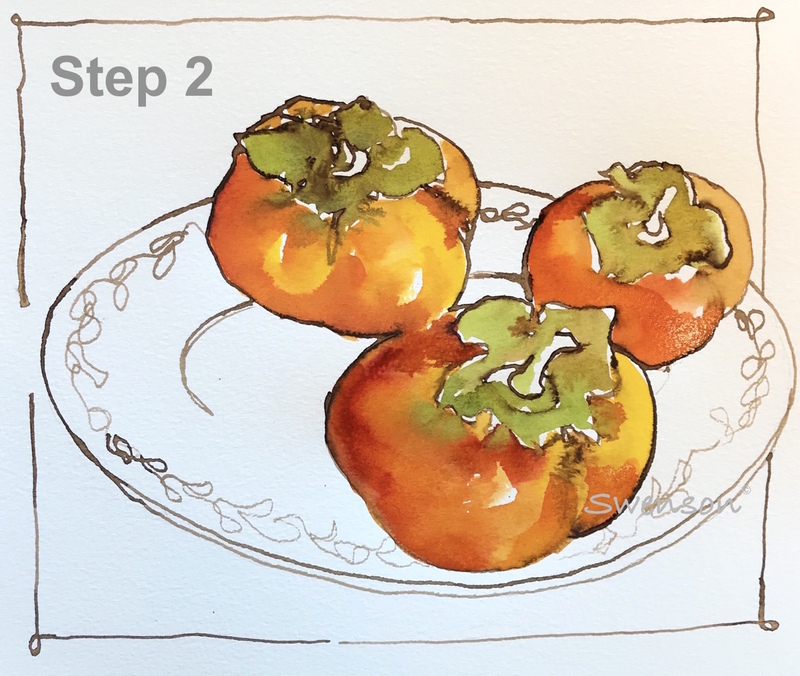 Your painting is as vivid and plump as the persimmons are! 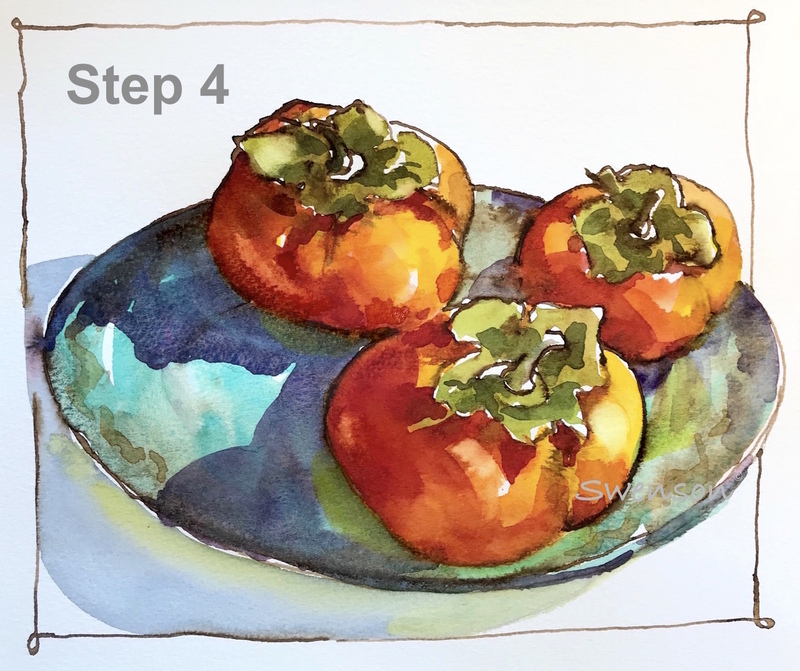 �� Your gorgeous shadows and Imperial Purple in the background, they almost act as a frame does to show off your persimmons! Thank you so much. 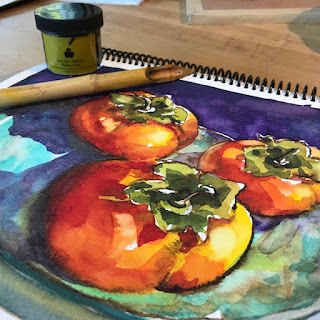 It's so much fun to play with ink and watercolor! Thanks for sharing the pigments and your approach for the shadows. Good to know.